The Pakistani bureaucracy has been acclaimed as the inheritor to the proceduralist bureaucracy of the khagazi raj or ‘document rule’ of the British colonial administration. The continuities with post-colonial Pakistani bureaucracy have frequently been noted. However, in recent years, parts of Pakistani bureaucracy have been prodded by international development assistance to reorganise on the lines of market efficiency, intermeshing the private corporate sector and ‘civil society’ with traditional bureaucratic proceduralism. This primacy of the market has been argued to have combined with new ideas about the legitimate relationship between state and society, advancing a new vision of the state itself. Elsewhere, bureaucracies have been studied as flexible, affective and humane organisations rather than rational, inflexible, and disenchanted structures. Pakistan is no exception to the moral embeddedness of bureaucracy and the fallacy of the impersonal bureaucratic persona is self-evident in a society where relations of patron-client have been suggested as foundational. This is a call for papers to explore aspects of Pakistani bureaucracy as networks –whether in the Latourian sense as in the Actor-Network Theory, or in a more traditional sociological understanding as forms of association between individuals and groups. The Pakistan Workshop 2014 invites researchers of Pakistan and the Pakistani diaspora to submit abstracts around this theme. ‘State, society, bureaucracy and networks’, as the theme for 2014 workshop, is only a guide to encourage submissions around this area which has been under represented in the academic discussions on Pakistan. You may submit abstract of your papers even if they do not coincide with this theme but would be of interest to those working on Pakistan. The Pakistan Workshop was originally intended to bring together anthropologists and sociologists working on Pakistan, Pakistani diaspora and Islam in South Asia. However, we regularly receive work from a broad range of concepts and disciplines. This workshop is a forum for younger and more experienced researchers, providing an opportunity for people working in common fields to get acquainted with each other. It is therefore normally kept small and intimate with a group of 25 or less people. The venue, Rook How, is one of the oldest Quaker Meeting Houses in Britain and is an important location in the Quaker world. The Rook How offers dormitory style sleeping arrangements which are comfortable and affordable. For those who prefer B&B accommodation, there are several nice places around the area which can only be accessed if they have their own car. The deadline for abstracts is 28 February 2014. The selected contributors will be requested to pre-circulate their papers to two weeks before the workshop. For further information send an email at pakistanworkshop@googlemail.com or aq1@soas.ac.uk. R Radhakrishna’s tribute to G S Bhalla (EPW, 19 October 2013) has rightly highlighted the contributions of G S Bhalla to agricultural economics and regional development in India. As a former student of his at Panjab University (PU), Chandigarh, I want to mention a few of his contributions to radical political culture in Punjab. It was only a few months of G S Bhalla and Sheila Bhalla’s joining the economics department at PU that we, a group of left­wing students in the university sympathetic to Maoism then, became aware of Bhallas’ silent encouragement to us. We organised a condolence meeting to pay homage to Ho Chi Minh and the only faculty members who joined this meeting were the Bhallas. We soon came to know that Bhalla was sympathetic to the Communist Party of India but not even once did he criticise any left-wing activity we students undertook. There was an unsaid understanding between us that since the left in general was weak in the university, we needed to support each other irrespective of the differences between us. Bhalla followed this non-sectarian approach throughout his life. The management of PU has, for a very long time, been controlled by right-wing groups supported both by the Congress and the Jan Sangh, and later Bharatiya Janata Party. Three left-wing teachers who took the bold and far-sighted step of challenging this dominance were G S Bhalla, Dharam Vir of the chemical engineering department (a man of remarkable intellect and moral stature who was a lifelong friend of Bhalla and died almost within a month of G S Bhalla’s death) and Gurbaksh Singh Soch of the English department (who died young, about 20 years ago). They built up Panjab University Teachers’ Association (PUTA) into an organisation of significance in the governance of PU. Bhalla challenged and defeated a heavy weight pro-Congress faculty member V N Tiwari to the office of president of PUTA. Many left-wing teachers later became presidents of PUTA but the foundation of that left-wing organisational ascendancy was laid by Bhalla and Vir. G S Bhalla’s contribution to radicalising research orientation in economic studies on Punjab is immense. It would not be an exaggeration to say that almost all the left-leaning economists that Punjab has produced in the last few decades were students of Bhalla in one way or another. He was justifiably proud of this legacy too. 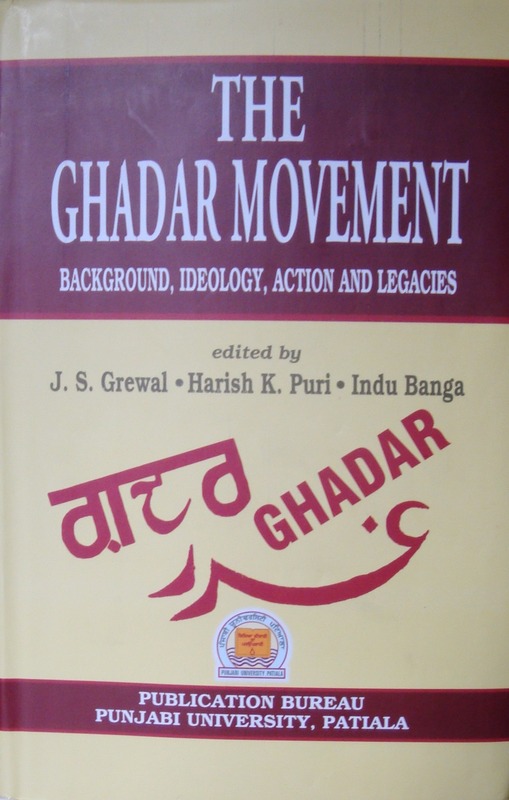 Thre e eminent historians have come out with a book on the Ghadar movement, which was launched 100 years ago and played a defining role in militant activism and opposition to the British rule in India. The book has been written by Prof J S Grewal, Prof Harish K Puri and Prof Indu Banga. It spans 613 pages and is divided across five sections with thirteen contributors in total, including the book’s three editors, two UK scholars (Darshan Tatla and Shalini Sharma), and several others from Panjab, England and North America. Besides the individual chapters, the book also contains over one hundred pages of primary source material (mainly in Gurmukhi), including some extensive excerpts from the original Ghadar newspaper published in San Francisco from 1913 on. We are giving away one complete set of The Punjab Trilogy, documentary films by Ajay Bhardwaj. Who passes the message that Ranjha has arrived disguised as a Jogi to the Khaira’s village to Heer? The winner will be chosen at random from a draw of correct answers and will be announced on our Facebook page in the 1st week of December and all decisions are final. One entry per person & we welcome entries worldwide.